That same rationale is not extended to the unemployed, solo-mums, and others, who are painted as wilfull “dole bludgers”, “druggies”/”alcoholics”/”gamblers”, “work shy”, “irresponsible breeders”, etc, by Bennett, Key, and other National Ministers. For them, the excuse of a global crisis that destroyed millions of jobs doesn’t factor in (see: World unemployment figures set to rise in 2013, claims UN labour agency). 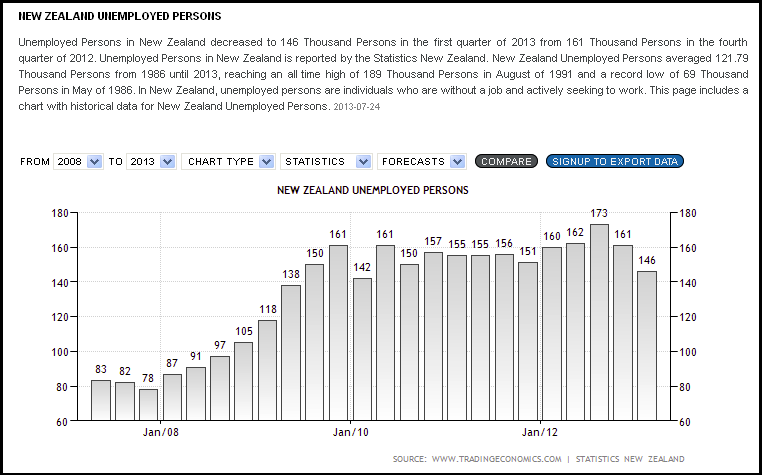 Aside from the Christchurch re-build National has done very little to implement job creation policies. A buy-NZ for governmenment procurement would help boost employment, instead of sending jobs overseas by buying from low-wage societies. Job training and upskilling of unemployed has been so poor that workers from overseas are being brought into the country to make up for a skills-shortage. So before Key predictably opens his mouth and blames others for our chronically high unemployment rate, he could do well to ponder these points. If Key is finding it chilly right about now, it’s because he is standing in the the shadow of his predecessor. Ms Clark certainly did not repeatedly blame others for her failings. Something else Key might consider. This blogpost was first published on The Daily Blog on 7 August 2013. It’s not that Key is trying to shift blame on to Labour – as he usually does when avoiding responsibility for one of his stuff-ups (see: Taking responsibility, National-style, and National’s disdain for taking responsibility). No, this time he is invoking the credibility and mana of his predecessor to justify his own dubious actions on the scandals and unpopular legislation swirling around him. Despite a few trivial errors of judgement, Clark left Parliament with her reputation intact; enhanced; and invited to work for the United Nations. Contrast that to John Key whose reputation for distortion; fudging the truth – and in my opinion, some outright lies – has left his reputation in tatters. 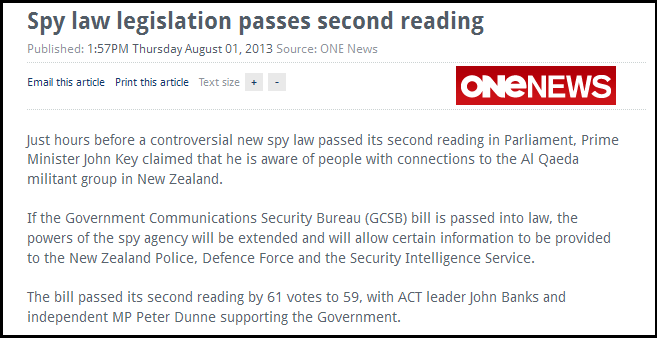 Channelling his predecessor’s name appears to be Key’s last card to justify an unwarranted extension of governmental power; the growth of the policed surveillance state; and his involvement in illegal spying on a member of parliament and a journalist. If that is all he’s got left , then he’s heading for rock bottom. This blogpost was first published on The Daily Blog on 4 August 2013. SUGGESTED $50K DONATION SPLIT IN TWO! In an interview on Radio NZ’s ‘Checkpoint’, ACT President Chris Simmons confirmed that ACT MP John Banks did ask Kim Dotcom to split a $50,000 donation in two. John Key must stand down Banks as a Minister, whilst the matter is investigated by Police. In fact, this blogger goes further; there is now sufficient evidence that John Banks has consistently lied on this issue; provided a false campaign donations return; and tried to cover up the donations from both Sky City and Kim Dotcom. Key is now Prime Minister. He should know what to do next. As this blogger wrote in a previous blogpiece ( Money in the Banks ,Part #Rua ); again, Dotcom’s claims are confirmed – whilst Banks’ story changes almost daily. Latest Horizon Poll – Results!! Whether or not National leader John Key and Act candidate John Banks should authorise the public release of a conversation between them recorded by a member of the media. Firstly, how did the two main leaders make people feel? The poll indicates that the preceding week has made people feel angry, nervous and afraid about John Key. Conversely though, Key makes people feel comfortable, excited, proud. The results seem contradictory in one sense – but perfectly understandable in another. Key’s “honeymoon” with the media has ended – and that with the public is waning. He is now more of a political figure, rather than apolitical as some perceived him, and therefore is beginning to polarise voters. It is when negative feelings toward a leader becomes more entrenched that support for a government will drop away – as happened with the Clark-led Labour government in 2008. It’s interesting to note that Goff elicits a growing hope (+8.6%) and pride (+7.4%) whereas people appear less hopeful with Key (-6.7%) and less proud (-4.5%). This would appear to tie in with recent polls, which also indicate a decline in consumer confidence. Also of interest is that Key is making people feel more angry (+9.7%), afraid (+8.8%), and nervous (+5.6%) than respondants feel for Goff (+3.8%, +5.2%, +3.1%). Issues such as asset sales, cost-of-living increases, high unemployment, and a stubbornly stagnant economy probably play a significant part in such results. Also, with Key’s brittleness over the “Teapot Tapes”, the public have have their first glance under the “ordinary bloke” facade that Key and his advisors have so carefully cultivated. The man is nowhere as laid back as he makes out. He can get rattled and when things aren’t going his way, he has no hesitation in removing himself from the scene – as evidenced by his recent media conference walkout. Again, this is reflected by the fact that +1.6 appear more comfortable with Goff – and significantly, people’s comfort level with Key has decreased by -0.5%. 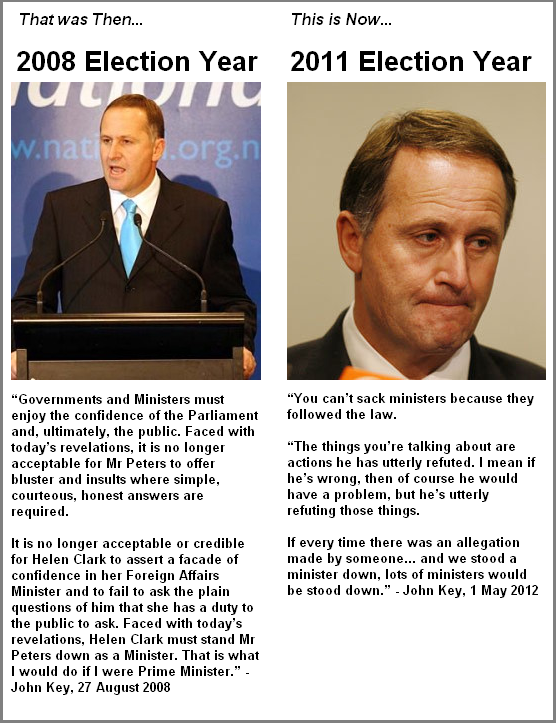 Is Key’s “ordinary bloke” facade developing cracks? Key is see as more inspiring, knowledgeable, and stronger. Key’s past career in speculative trading in the commercial sector may be a factor in this. With the collapse of dozens of finance companies in New Zealand, owing billions to “mum & dad” investors, and with the global banking crisis sparked by dubious activities on Wall Street, those who are engaged in speculative commerce, finance, stocks, etc, are now viewed with suspicion and often downright hostility. An underlying subtext to how people view ‘Brand Key’ is that while people certainly consider him to be more knowledgeable than Goff (and the Christchurch “Press” debate may reinforce that impression) – that Key is less trustworthy for reasons outlined above. Conversely, Goff is seen as more trustworthy, honest, and moral – perhaps because unlike Key, Phil Goff has not be ‘tainted’ by the smell of Wall St excesses. Goff may be seen as wanting to do the “right thing”, whereas Key is seen as a product of hard-nosed business. 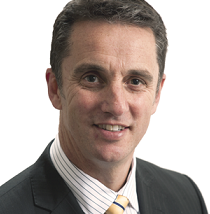 Goff has also been candid in admitting that Labour made serious mistakes over selling state assets in the late 1980s. He has apologised for those grievous errors of judgement – no mean feat for a politician. This underscores his trustworthiness compared to John Key’s, right or wrong, in the eyes of the public. The results comparing those who will “definitely” vote, with those for voters who will “definitely, may or probably” vote. 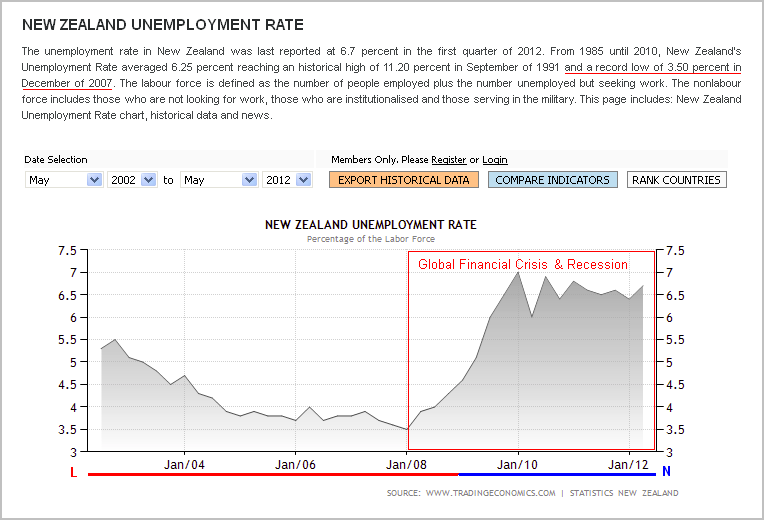 Noteworthy is the growth of support for NZ First and the fledgling Conservative Party. If accurate, the Conservative Party are within a hair of crossing the 5% thresh-hold. “The results indicate a National-Conservative-Act-Maori Party- United Future grouping would have 59 seats in a 122 seat Parliament. This assumes Act and United Future win Epsom and Ohariu, the Maori party has 4 electorate seats and Mana one. A Labour-Green group would have 47, and 50 if joined by Mana. New Zealand First would have 13 seats and the balance of power in the new Parliament. A National-led coalition would muster 73 votes with New Zealand First support. “The country is highly polarised over the unauthorised recording of a meeting between the Prime Minister, John Key, and the Act party’s Epsom candidate, John Banks. 53% say that neither Mr Key nor Mr Banks, as parties to the conversation, should authorise the public release of the recording. 46.9% think they should authorise its release, according to a major nationwide HorizonPoll, covering 2,874 adult New Zealanders, conducted between 9 am Wednesday and 5.39am Friday (November 16-18). Weighted by age, gender, ethnicity, personal income, education qualification and party vote 2008, the poll has a maximum margin of error of +/- 1.8%. 54.9% also believe the November 11 recording of the eight minute-long conversation, on a microphone left on a table at a Newmarket café by a member of the media, was deliberate. 15.9% say it was inadvertent while 29.2% are not sure. Asked if the Herald on Sunday, which had the recording last weekend but decided not to publish, or other news media should publish it now, 49.4% say no, 39.5% yes while 11% are not sure. 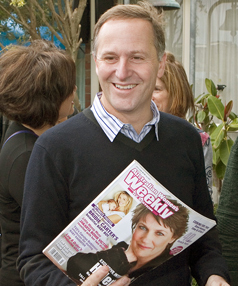 Among those who voted for National in 2008, 17.7% think the issue has made Mr Key less credible, 12.3% more credible – a net credibility loss of 5.4% among his supporters at the last election. The Horizon Poll there backs up other public feedback where a majority believed John Key’s assertion that the conversation between himself and Banks was a private matter and that there was no requirement for eithrer of the men to release the tapes publicly. Despite this feeling, 41.9% of respondants believed that the affair left Key looking less credible. An interesting mix of views, though it coyuld be argued that Key did indeed manage to correctly gauge public opinion on this issue. However, as point out in my piece Tea, tapes, & tantrums – the overal effect is that Key’s teflon veneer has been significantly scratched by this incident. It will be interesting to note if Horizon Polling has been an accurate assessment of public opinion. As people correctly state, the only Poll that counts is the one on Election Day. Horizon will be measured against that final outcome.